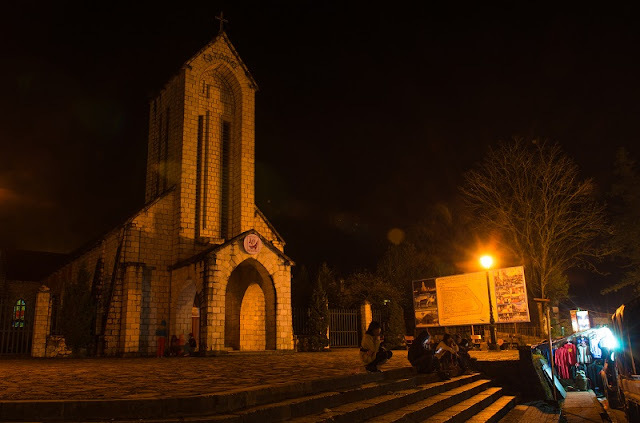 Home > Travel guide > What activities at Sapa at night ? The walk around the town for shopping, see traditional dancing from ethnic people and music game show from government. Only by going a little bit farther to the Rattan Bridge can you feel the wilderness of each line of trees and this Northwest mountain area. The whistling wind and the cold fog are the only things going through your ears at that moment. Sometimes, you will catch sight of some lovers hand in hand walking along the streets, talking, cuddling and kissing. If you take the trip with your beloved one, do not forget to make use of Sapa’s romantic night to have some unforgettable moments! 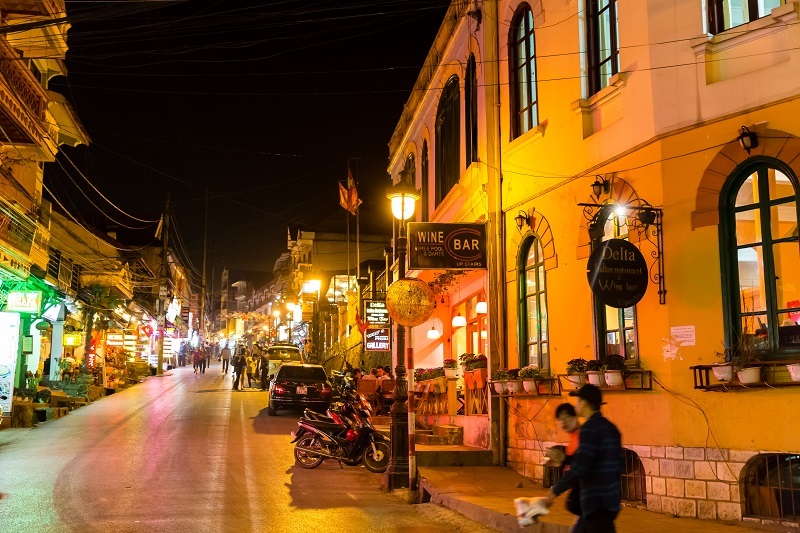 You can go shopping at night in Sapa town. The town also organize a walking street from 7pm to 9pm. You also can go to the food market to have some BBQ. The cool weather of the region makes barbecued meat and fish with mushroom and vegetables the most preferred street foods in Sapa. People grill corn, sweet potatoes, dumpling, bamboo-tube rice, or even eggs as well. Nevertheless, tourists can try many other local foods like purple sticky rice or “thang co”- horse meat right in Sapa market. Or join Love Market in Saturday night, one of distinctive cultural features here.It is on Saturday night that young villagers get a chance to get to know each other by joining such activities as playing leaf-horns, playing traditional games, singing and dancing, etc. The performances filled with romantic melodies express fervent wishes for eternal love. Not until the early hours does the market finish, leaving happy memories in the minds of many mountain people. After that night, some are lucky to find out the match and make an appointment on the next market. Many of them have later become partners sharing the same life for good and for bad. The love market has long been the not-to-be-missed event reflecting special culture of people of mountainous areas in general and of Sapa in particular. 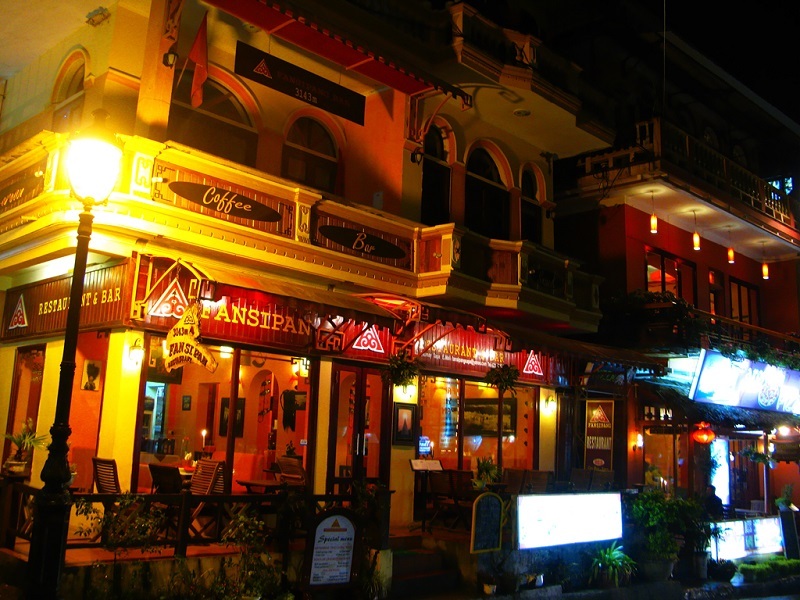 Bar: Going to bars or pubs at night is one of the most favorable activities in Sapa. Usually, bars will open in the evening until 1:00 am the following morning (some close sooner though). Tourists, especially foreign travelers, are always in favor of bars and enjoy getting there most of the time. Partly because the unique atmosphere of Sapa’s bars that attracts every visitor both domestic and international. Not crowded, noisy, flashy or luxurious, the peaceful and friendly aura from these bars is enough to lure the customers in. Sapa night will not only romantic scenery, ambiguous under the night mist but also a lot of activities, other interesting destinations take place. Do not waste such an exciting evening in the hotel room. Please join together with the people here to create memorable experiences.